The day dawned bright and sunny even though there were some dark clouds being chased by the wind. From our inn in Ingleston, the taxi took us back to the Station Inn where we were picked up yesterday so that we might continue our journey. 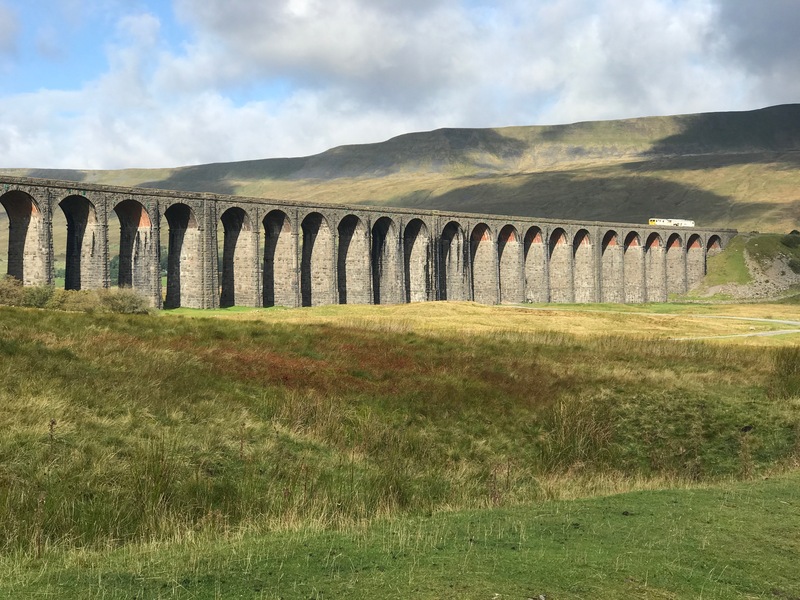 We began by walking past the Ribblehead Viaduct which was built in 1870-1875. It is a beautiful piece of engineering as a railway bridge. As we followed the trail up hill from the viaduct we found grouse just of the path. It is not quite yet grouse season, fortunately for these two! We followed the rail line for some distance across Blea Moor until the rail line disappeared into the Blea Moor Tunnel. This tunnel is one of the longest in England at 1.5 miles. At this point, we began climbing to the top of the Moor where we passed several of the tunnel ventilation shafts. This was quite a long climb and every time I thought we were at the top, there was still more climbing to do! When we started the climb, the weather was sunny, but there was a chilly wind blowing. By the time we climbed to the top, the rains had come, it was dark and dreary and cold! We eventually did find the top of the moor and began to work our way down again into an area called Mossy Bottom. This area went through a pine forest. The neatest thing was the forestation that was occurring here. There was a large area of mature large pine trees, another area of smaller, younger trees, another area off seedling protected in their plastic tubes, and a area that had recently been deforested. It was so interesting to see the different areas at work. We stopped under the trees, where there was a break in the rain and the wind, for a quick snack. Walking out of Mossy Bottom, the ground became very muddy and boggy. One of our group members, Shirley, stepped into some of the mud and it went up to her knees. The suction was so great that she couldn’t get out. Paul literally had to reach down into the mud to free her feet. A little bit scary! We continued on to find the North end of the tunnel, as well as a small waterfall. From here, the path wound through some very pretty countryside until we came to Dent’s Farm. Here, the path went through the a gentleman’s front yard. He stopped us at the gate, asking us to wait until the entire group was together. He is a retired RAF engineer, and he and his dog, Maggie seemed to really enjoy having visitors! As for the weather he even mentioned that every place has four seasons – England just has them all on one day. We had to heartily agree to that as the rapid changes from sun to rain, warmth to biting cold winds were occurring is rapid succession today! Instead of having us continue on the path, he led us to the other gate that followed down his driveway to the road. Apparently, it was so muddy along that stretch that several people had fallen and hurt themselves recently. Walking along the road, we passed by Dent Head Viaduct. After a short hike, we picked the path back up that led to Artengill Beck. Although the rain had stopped as we walked through Mossy Bottom, it was starting up again. As we climbed the hill, we made it to Arden Gill Viaduct, where we stood in semi-sheltered areas to eat our lunch. Between cold wind and blowing rain, we didn’t tally long. Climbing to the top of Dent Fell, we then folllowed the ridge line for a couple of miles before coming down the hill to Crosshills Wold. The way across the fell was much like the rest of the moors. Very boggy, very muddy, and full of sheep poo. Let me explain. Much of the trail and footpath actually go through the farms and pastures of the local sheep farmers. Walkers are responsible for making sure the gates are closed and latched after walking through them. Many of the gates have stiles that you must climb over or though, instead of gates. You really get to be up close and personal with the sheep in the fields. The sheep will only let you get so close to them before walking away, so you really are not able to “pet” them. However, it does make interesting walking – I began to believe that the sheep wait until they are on the path before they poo – just to make our walks more fun! 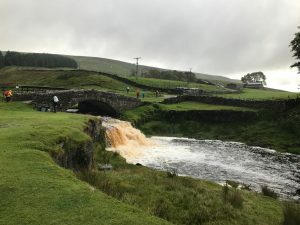 With all the rain, there is a lot of standing water on the moors, and water has a tendency to run downhill. As it follows the paths of least resistance, it tends to flow in streams right in the pathway. Rocks in the path really help, but there are also mud holes. If the path becomes too muddy and you step off the path into the grass, you run into another whole host of problems. When you put your foot down on the grass, you never know if it will hold you, let your foot sink into mud, or into water. In may ways, the moors are a bit like walking on a sponge; very squishy and wet. From Crosshills Wold, we followed the road the last few miles to our rooms for the night. Tonight, we are at the Moorcock Inn at Garsdale. In case you are wondering, Garsdale consists of about four buildings – the inn, which is also a pub, a B&B, and two other buildings. I did find a geocache out here, though! After hot showers and changes of clothes, the group hung out in the pub until dinner time. Tonight I had Yorkshire Pudding with sausage and gravy – after all, who can come to the Yorkshire Dales without having Yorkshire pud? So very yummy! I even treated myself to a Black Current crumble for dessert. It is about time to call it a night so that we can hike more tomorrow! I woke this morning at 5am listening to the rain. As it continued over the next couple of hours, I had worries about this day of hiking. After breakfast at the Moorcock Inn, we set out in a light drizzle that steadily became heavier as we hiked back up into the moors. As we started along in the sheep field, we crossed a rushing river (all the rivers and becks are quite full with all the recent rains) near Yore House. As you can see in the picture, the water is tinged brown. This is the color that it picks up from the peat in the moors and fells. From Yore House, it was a long climb to the ridge where we walked for a good part of the afternoon. Along the ridge line, the scenic views were beautiful. We could look back down the valley we had climbed and even see Dandry Mire Viaduct in the distance. (We had passed this viaduct on the way to our Inn yesterday. 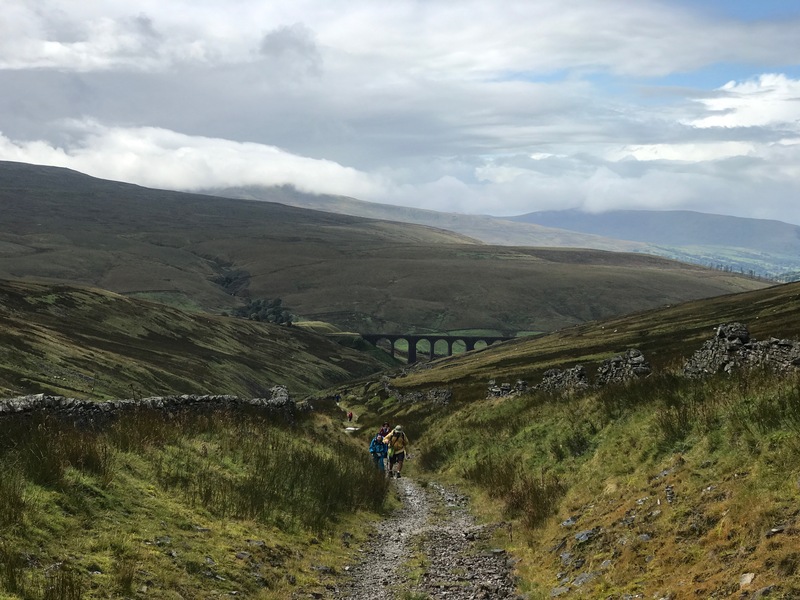 Following along the ridge line, we could see the Road that goes to Kirkby Stephen, as well as the Settle to Carlisle rail line that we have been following this trip. Along the ridge line, there were several ruins of what I can only imagine to be old Yorkshire crafts, or small private farms. Several of the ruins showed evidence of pig sties, sheepfolds, and other small farm building. The homes themselves were tiny and built of stone. I couldn’t imaging living up in these moors with the winds and rains, snow in the winter – it seems a very desolate and bleak environment. And yet, it is also beautiful up there on the moors and I can also see the attraction! Hiking along, as the rains came and went – with sunshine between the rainshowers, I looked down into The Valley at one point and saw a beautiful rainbow stretching across the sky. 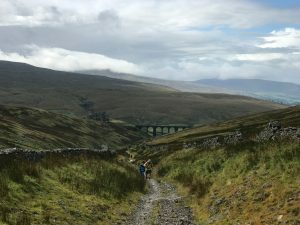 We passed Hellgill as we hiked out of the Yorkshire Dales National Park. The beck (stream) at Hellsgill is the source of the River Eden, which we followed most of the rest of the day. As we crossed over the bridge of the beck, I tried to spy the water below us but it was in a very deep cut, and I was unable to see the river. We continued to hike along the ridge of the moors, passing “Water Cut” – a sculpture set on the Penine Way. From the statue, we began a gradual down hill until we met back up with the River Eden. We continued hiking though various sheep fields, passing over stile after stile, through gate after gate. At one point, stopping for lunch as the sun came out. However, with a fickle as the weather is, as soon as we all sat, pulled our lunch out of our bags (and Verna got a picture of our first sunny lunch), the rains started again! Once more we ate in the rain! 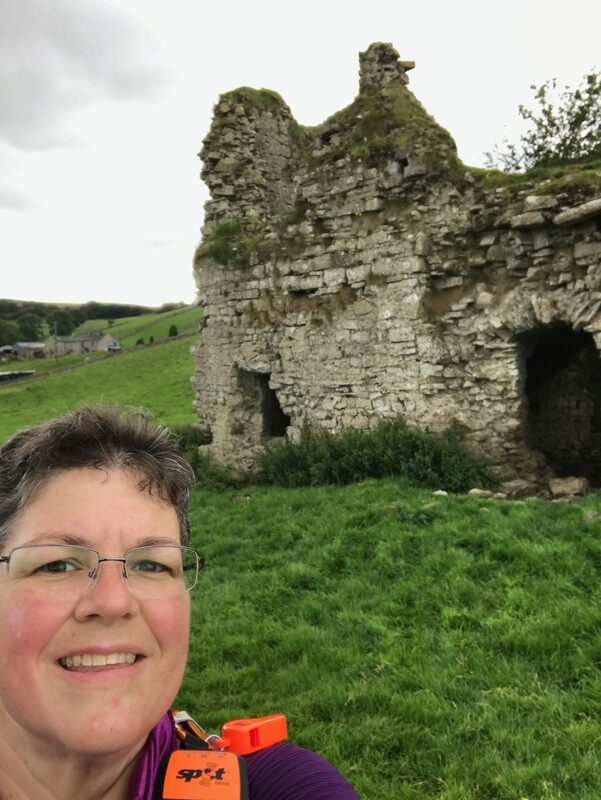 Continuing on, Our path led along the river, through a couple of small villages and farms, passing by the ruins of Pendragon Castle. According to legend, it was built by Uther Pendragon, the father of King Arthur who is said to have unsuccessfully tried to divert the river to provide its moat. However, despite legend, there is no evidence of any pre-Norman use of this site. It has the remains of a Norman keep with he later addition of a 14th century turret, and some further additions int he 17th century. After passing Pendragon Castle our path led around Birkett Common. This area was quite nice to hike – fairly level and a wide path. There was still a lot of mud that we had to work around, but at this time, the sun was out and it was getting very warm in all our rain gear. Most of us took off the rain gear as the skies looked as if they were clearing. Rounding Birkett Common, the trail turned to the left and went passed another castle – Lammerside Castle. Lammerside Castle is a 12th century building which was rebuilt and strengthened in the 14th century as a Pelé tower, to provide protection against Scots raiders. The ruins include the remains of a tower or wing which originally formed part of the building’s central core. I was able to walk into the ruins of this castle and tried to imagine how it might have looked when it was whole. For now, there is no roof, and there is plenty of evidence the sheep and cows use it for shelter. Just as we were leaving the castle, it started raining again – and our raingear went back on! Continuing along the trail, and passing through Whartons Hall, a farm where we could see dairy cows lined up to be milked (at least that is what it looked like to me), the trail headed back across more fields. We found a huge oak tree that must have been centuries old. Much of the center of the tree was hollow and Mom jumped right in to have her photo taken. Through more sheep fields, across more farms and finally came to a small paved road that led into Kirkby Stephen. Our B&B is in the heart of the town. I spent the afternoon looking for a outdoor shop to find waterproof gloves but ended up not getting any at this time (the only ones they had were thick and bulky – ie, ski gloves). Hopefully, the rains are moving out and the gloves wont be needed. The best part about our B&B: they took our boots to dry and clean them! Can’t wait to put dry boots on tomorrow!